The picture above is courtesy of Neil English who participated on the trip on behalf of the Mail On Sunday. You can read his article by clicking here! 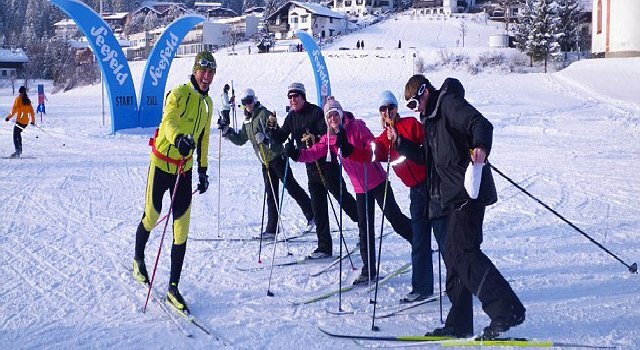 Apart from trying out cross country skiing with expert instructor Michael Multerer, the group also took part in downhill skiing, dog sledding, and of course enjoyed the spectacular hospitality of the restaurants, bars and hostelries in Leutasch and Seefeld. After all, after all that fresh air and excercise there is a no harm in rewarding yourself for your efforts. Snow conditions are still excellent in Europe so if you fancy a week in a gorgeous hotel with great food, fresh mountain air as crisp as the chilled champagne in the bar, and amazing winter activities then look no further than one of our acclaimed Headwater snow holidays. Alternatively, just call us for a little guidance and inspiration as to which trip would be perfect for you on 01606 720 033.